She used her powerful skills in mathematics and languages to create a comprehensive math text that brought together many great works separated by time and language. Born in Milan, Italy, in 1718, Agnesi was the eldest of 21 children. Her father held a position as mathematics professor at the University of Bologna. Her early life was steeped in an academic environment. A child prodigy, Agnesi could speak many languages at an early age. Her father encouraged her to participate at the social gatherings of intellectuals held at their home. By age nine, Agnesi had written in Latin a defense of women’s education. 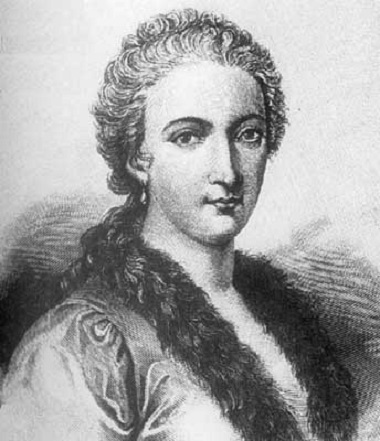 As she grew older, Agnesi tutored her younger brothers. In 1738 Agnesi published a collection of essays on natural science in which she also continued to champion education for women. Over the following 10 years, Agnesi began work on a math compendium, which had been started as a text for her younger brothers. Agnesi eventually published it as the four­part Analytical Institutions in 1748. It included discussions of the work of scientists and mathematicians such as ISAAC NEWTON, RENÉ DESCARTES, and PIERRE DE FERMAT, as well as a comprehensive range of subjects in mathematics such as algebra, geometry, and calculus. One of the mathematical elements described by Agnesi was a special bell­shaped curve whose equation is x2y = a2 (a­y). Her geometric description of the curve, referred to as versiera (versed sine curve) of Agnesi (which over time has been incorrectly translated as the “witch of Agnesi”), continues to be of interest to mathematicians. Her work drew critical acclaim from many in Europe. Pope Benedict XIV thought highly of her accomplishments, and in 1750 he offered her a position as honorary lecturer at the University of Bologna. Two years later, in 1752, she decided to turn her attention to charitable work. Agnesi eventually became the director at a home for the aged in 1771. She remained in this position until her death on January 9, 1799. Maria Agnesi demonstrated to Western Europe that a woman could be a successful mathematician. Her compilation of mathematical knowledge reflected her grasp of complex mathematical concepts and provided a source of information for countless others. Her text, Analytical Institutions, was translated from the original Italian into French and English. Her writing made many mathematical subjects—algebra, analytic geometry, the calculus, and differential equations—accessible to a wider audience. By compiling, translating, and organizing widely scattered papers, Agnesi enabled students to spend their time learning about mathematics rather than searching for sources. The work would become an invaluable resource for mathematicians and students of mathematics throughout Europe. During her lifetime Agnesi advanced the cause of women’s education. Her arguments on the matter were widely read and they gained the attention of influential people such as the Empress of Germany and Pope Benedict XIV. Posted on March 4, 2015 by Natalie. This entry was posted in Mathematicians. Bookmark the permalink.